Do we need a code of conduct for virtual reality? 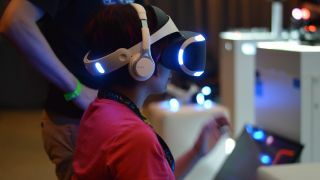 A team of German researchers has come up with a list of the major risks that might arise with virtual reality technology, as well as a "code of conduct" to minimise problems down the line. The promise that VR holds in business, education and entertainment has driven major excitement around the technology in the last few years. But Michael Madary and Thomas Metzinger from Johannes Gutenberg University Mainz say that associated ethical concerns have received far less attention. "One's environment can influence one's psychological states," the pair write in the article, published in the journal Frontiers in Robotics and AI. "Immersion in VR can have psychological effects that last after leaving the virtual environment." Referring to recent studies showing these effects, Madary and Metzinger argue that VR could create vast opportunities for psychological manipulation. "These studies suggest that VR poses risks that are novel, that go beyond the risks of traditional psychological experiments in isolated environments, and that go beyond the risks of existing media technology for the general public." The code of conduct they have come up with as a solution revolves partially around scientific practice. Researchers shouldn't create false hopes in patients, for example, and repeatedly remind them of the experimental nature of any such research. They call for more studies on what's lost in social interactions based on telepresence. But there are worries over consumer applications too. Madary and Metzinger point out that EVE:Valkyrie, one of the most heavily anticipated VR titles, takes place in a universe that rewards characters that manipulate and deceive other players. "There is cause for concern about behavioral patterns rewarded in immersive games such as EVE: Valkyrie having a lasting influence on the psychological profile of users," they write. "Torture in a virtual environment is still torture"
They also warn of using violent and pornographic content where the risk of psychological trauma is higher. "Torture in a virtual environment is still torture," they say, recommending that users be clearly informed of these dangers. "The fact that one's suffering occurs while one is immersed in a virtual environment does not mitigate the suffering itself." Finally, Madary and Metzinger point out that there are few regulations regarding the ownership of avatars in virtual spaces. They write: "There are strong reasons to place restrictions on the way in which avatars can be used, such as protecting the interests and privacy of individuals who strongly identify with their own particular avatar on social networks"